Video is popular and getting more so this year, and I hear many asking how to include video in their blogs. Click on that button, and the space below it will an expand with more options. Make sure you unclick the related videos if you don’t want more videos to pop at the end of the video. 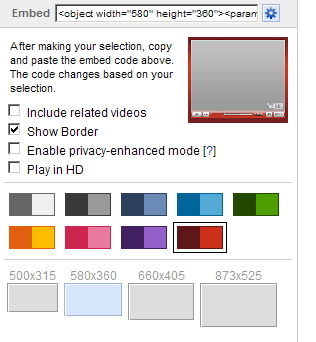 Also, if you’d like to add a border around the video, you can pick any of the color combinations you see there. 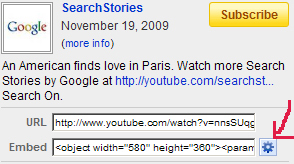 You can also choose the size of the video. Once you are done, it’s time to copy the code and paste it into your blog. Click anywhere on the field next to “Embed”, and it will be highlighted. Point to where you’d like the video to show, and paste the code. You are done. And it was really easy, wasn’t it? If you still have questions, feel free to leave a comment below. Adriana, thanks it was easy, once I found out I had to past it to the html tab!